This Ninpô Taijutsu Gen (2) is a holistic fighting. The physical is reinforced by the spiritual. Uke is not defeated by the body movements, but rather by his wrong perception of reality. His mind is played by Tori’s attitude. Again the class yesterday class was about illusion. It is interesting to see that “Kyomu” bears the same kanji as Kyojitsu (3), the alternating stages of truth and falsehood. Sensei did many henka on Omote Gyaku, showing tens of variations. The Omote Gyaku Waza imposed itself at some point in a natural manner. I find interesting to study it again, after the class we had with Nagato sensei on the same subject. It looked like “the next step” that sensei keep speaking about. When you move with this natural reaction, everything is soft and looks quite slow. But the key point is to awaseru, to meet the opponent’s attack, fearless. 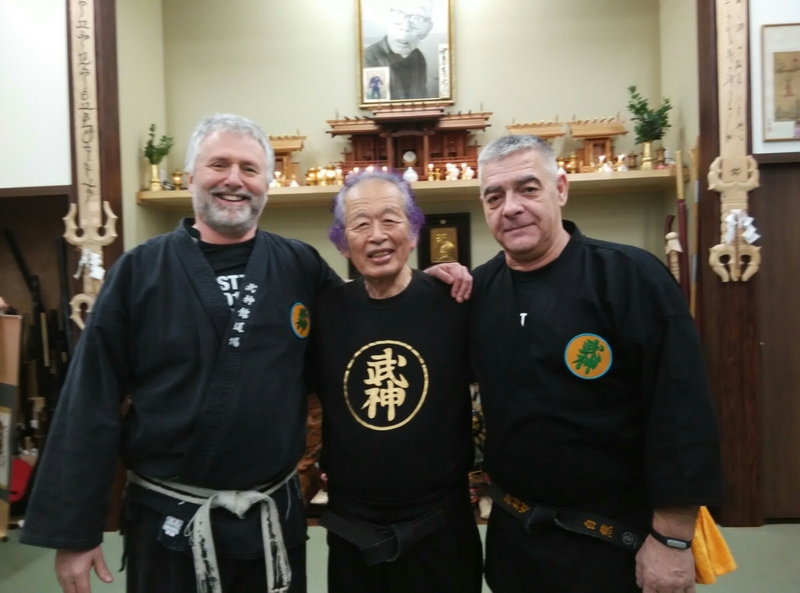 It felt like going back to the year of Kuki taishô (4) I guess it is hard for the new generation to comprehend what sensei is doing these days, because everything is based upon the teachings on Juppô sesshō that we began in 2003. In fact, he said that because of Juppô sesshō, there was no left, right, fast, slow, win, lose. Everything that he did is logical with the understanding of the situation he is facing. And it looked logical, soft and natural. He illustrated this Juppō Sesshō with some sword techniques. As the theme this year is Mutô Dori, he began unarmed and then moved to two swords, which is also mutō dori (5). In Koteki Ryûda Juppō Sesshō Hibun no Kami (6), theme of 2003, the eight directions of the happō are completed with the vertical axis of heaven and earth. Heaven is ryûda, the flying dragon; and koteki is the crouching tiger. In the encounter you are dragon and Tiger alternatively, soft and hard, slow and fast. In the sword techniques sensei explained that you do not try to cut but apply multiple hits like if uke was attacked by a swarm of bees. This reminded me of the Amo Isshun no Tamamushi. (8) Uke is defeated by the many micro attacks he receives. In unarmed defense the sword his are replaced by Yubi Kudaki. This holistic movement is what sensei calls zenten (7). The body adjusts naturally to the suki (openings) of the attack / of the attacker. In both situations (with and without sword), you are soft and react naturally to the attack. Because of zenten, you move either in one direction or another like a skipping stone. Uke is the wave and naturally surf on his intentions. Last class was really magic and helped me to grasp the essence of Ninpô Taijutsu Gen.
3. Kyojitsu vs kyojutsu: there is often a misconception about this two terms. Kyojitsu 虚実/kyojitsu/truth or falsehood, and kyojutsu is 虚/kyo/unpreparedness|falsehood + 術/jutsu/art; means; technique. Therefore, kyojitsu is the concept used in kyojitsu techniques. 5. Reminder Mutō Dori is not only defending oneself unarmed facing a weapon. It is above all, having the courage to face a potential death. I wrote a few posts on that last year in this blog. Check them. 6. My book on ” Koteki Ryûda Juppō Sesshō Hibun no Kami” can be found at http://www.budomart.eu and will soon be available in ebook at Amazon.com (January 2016). 7. Zenten is 全天/zenten/all heaven, but can also be understood as 全店/zenten/the whole (store).